Yahoo! Messenger for Vista Preview (2008.01.11.428) Available ! Yahoo team released a new preview version of Yahoo Messenger for Vista. # Typing and switching between tabs and windows. # Ability to make the contact list narrower. 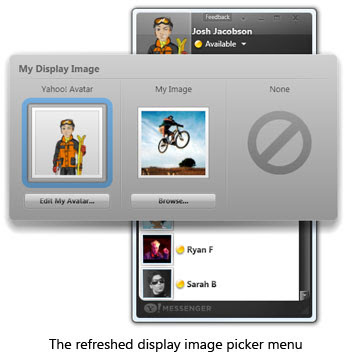 # Some menus, like the display image picker, have been cleaned up and enhanced. # Offline messages are more clearly displayed with a new “While you were out” tag and timestamp to denote the message. # Drag and drop a contact into the sidebar if you’re on a 64-bit version of Vista. # Red “X’ that sometimes appeared in place of a contact’s image removed. # The bug where the message window wasn’t always scrolling down as the conversation progressed fixed. # The contact list to maintain the open or close status of your groups between sessions fixed.